Happy Wednesday! I wanted to share some of the FUN we are having in math this week!! 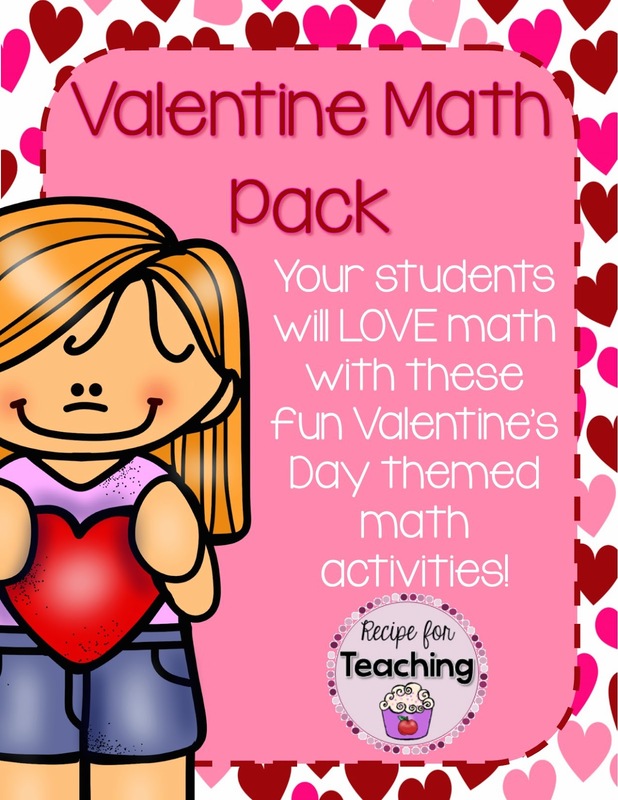 These activities can be found in my Valentine Math Pack. My kids just LOVE math! We are using this Heart Coverall game as our warm-up. They roll two dot cubes, combine the dots, and cover the number rolled. The kids love this game and love the little heart counters. They are just from the Dollar Store! Look at how this group separated the red and pink hearts! I had quite a few groups do that! One of my students came in the next day saying she had made her own copy of the Heart Coverall game!! Seriously the CUTEST!!! Starting today, I had them record what they rolled in their Notebook of Learning. We keep our learning across subject areas in one notebook called a Notebook of Learning. This Inside/Outside the Heart activity really helped us decompose 10. I had my students "rain hearts" (We read The Day it Rained Hearts before doing this) and then they had to count how many landed inside the heart and how many landed outside the heart. They had a recording sheet to record their numbers. This How Many More to Make 10? activity is helping us show how many more to make 10 and helping us with our combinations of 10. I included a math talk on this sheet. My kids are pretty much obsessed with math talks! When I don't give them a math talk, they ask if they can say the math talk!!! You can find this pack in my TpT store by clicking the picture below!